If it’s your first time skiing, it can be difficult to wrap your head around all the different types of ski lifts. Ski lifts are the main way to travel around the slopes and they’re great once you get familiar with them. Unsure where to start? 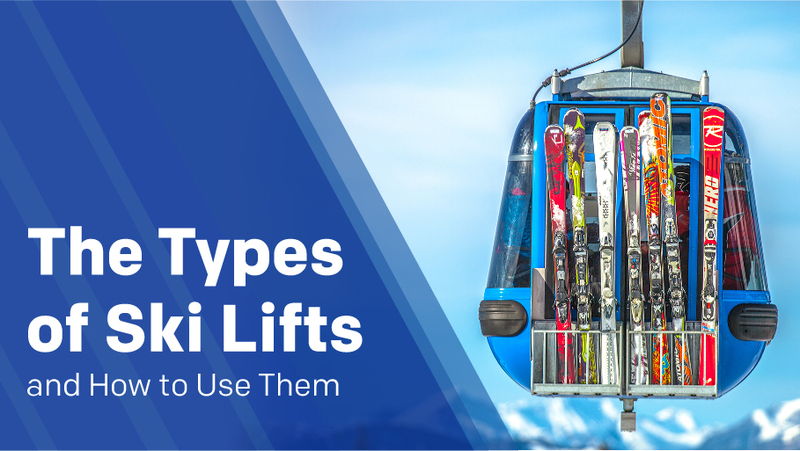 We’ve compiled a guide to the types of ski lifts and how to use them. Depending on the layout of the resort and the difficulty of the pistes, you will likely see a variation of ski lift types. Resorts try to build the best ski lifts to reduce wait times and get you to the top of the mountain as quickly as possible. Here’s a list of the main types of ski lifts you will come across when at your chosen skiing destination. These lifts are vehicles that are suspended in the air. There are a few different kinds of aerial lifts. This is the most common type of ski lift and it’s what you’ll probably picture when you think of one. The skier sits on the chair or bench and they are pulled up to the top of the mountain. Depending on how basic this lift is, you may have to brace yourself and jump off! Don’t worry, after you’ve tried it once, it’s easy to use. This ski lift is an enclosed carriage that can hold a group of people. There are a few different types of gondola lifts, so how comfortable and fast it is will depend on the model. Gondola lifts usually slow down enough for you to get on and off them smoothly. You can take a moment to put down your equipment whilst riding them. Like their name suggests, these ski lifts are designed like cages or baskets. They typically hold a couple of people and, like the chairlift, don’t always slow down when you get to the top of the mountain. Cable cars are comprised of two cabins. When moving, one cabin is pulled up whilst the other cabin is pulled down. They can hold quite a few people which moves the queue along swiftly. This type of ski lift is similar to the other aerial lifts, but travels longer distances. Trams hold a lot of passengers so there isn’t a lot of room for personal space! To use a tow lift, sit on the seat and hold on to the handle or bar as the lift drags you to the top of the slope. The different names of these lifts refer to the shape of their seat. Some of these types of ski lifts can look a bit daunting to a novice skier. They can also have very long queues which is frustrating when you’re itching to start skiing. Try these tips to make your ski lift experience more enjoyable! If you’re nervous – don’t panic (try the gondola lifts which give you enough time to disembark). If you’re skiing solo, find another person on their own and hop on the lift with them to cut the line. The queues are far longer for the lifts going to the top of the mountain. Use a ski lift type that doesn’t go too high. While the course will be shorter, you’ll be able to ski down it multiple times. Try skiing during lunch time or early in the morning. You’ll be able to beat the lines and go at your own pace. Take a shuttle to a less populated part of your ski area and enjoy a shorter queue. Let’s face it, we’re all trying to escape the crowds! Which Types of Ski Lifts Are Best? Deciding which ski lift is the best for you will depend on your needs. The different types of lifts all have pros and cons. Gondolas and cable cars are great because they are enclosed and protect you from the cold weather. They also give you more time to take in the beautiful scenery and take pictures. While chairlifts aren’t the best if it’s snowing, they move quickly. It can also be a lot of fun to jump off them! If you’re with children or you have a mobility issue, this may not be the best ski lift for you. Tow lifts are good for young children and beginners as they aren’t suspended very high off the ground and don’t travel long distances. Now you’re an expert on the different types of ski lifts, it’s time to book your holiday. Use Alps2Alps to book your airport transfer and we’ll take you from the airport to your resort with our affordable and reliable service.